Sepia Saturday: On the Street Where You Live by Jollette etc. This is the tombstone of Richard Engle, the husband of my 2nd Great-Grand Aunt Sarah Amanda Waterman. You may remember Sarah Amanda Waterman from a previous post. She lived to the remarkable age of 103 years old. Richard and Sarah are buried at the Mountain View Cemetery in Altadena, Los Angeles, California. Below is a picture where you can see both of their grave markers (Richard on the left, Sarah on the right) with the “Engle” marker above their individual grave markers. Richard was born on 8 November 1831 near Barnesville, Belmont, Ohio and passed away on 26 April 1917 in South Pasadena, Los Angeles, California. 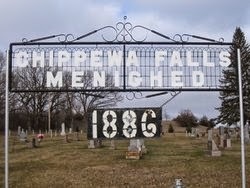 He was the son of Caleb Engle and Sarah Fawcett, both from Ohio. Richard served in the U.S. Civil War in Company G of the 63rd Ohio Volunteer Infantry. There are no cows or markets in this photograph, but it IS an interesting building with an interesting group of people in front of it. This group of people are posed in front of the Dental Office of my great-grandfather, Watson Emory (Frederick) Webster. Yes, you’ve heard of Frederick before. He is also known as The Traveling Dentist and as an inventor in previous posts on my blog. Frederick is the one seated to the far right with his arm around his son (my grandfather Debs Warren Webster). Sitting - Alice Jaques, Esther Allen, Alice Pickett, Geo. T. Pickett-General Mgr., Pauline Vanhorn, Dr. F. E. Webster, Debs Webster. Standing – W. J. Hoag, Douglas Briger, Esther Jacobson. If you look closely at the lady seated in the middle of the picture, she is holding what looks like a dental teeth model. Also, take a look at those beehives that are sitting right in front of the group. Yikes! On the back of the photo is typed the phrase, “Hiven (sic) wiht (sic) 11 Caucasian and Carniolan Queens in them to take to Brazil.” It looks like the first two words had some typos in them and are supposed to read “Hives with.” I did a Google search and Caucasian and Carniolan are types of bees. I don’t know about you, but I would NOT want to be sitting that close to beehives! Oh, and I would NOT want them as traveling companions on my way to Brazil either! 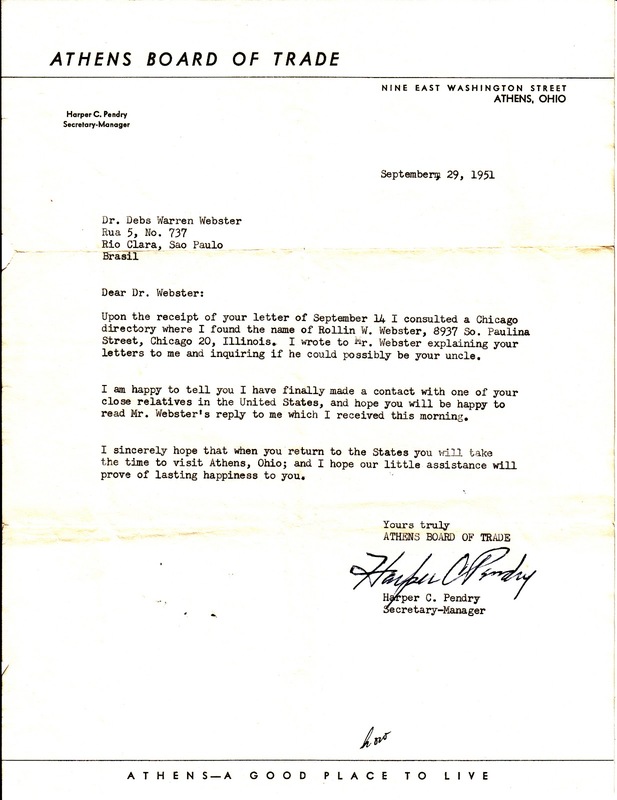 Who would have thought that a simple letter of inquiry to the Athens Board of Trade in Athens County, Ohio, would result in the reuniting of my grandfather with his uncle. But it did! It's even more amazing because my grandfather, Debs Warren Webster, was living in Brazil, and his uncle, Rollin Waterman Webster was living in Chicago, Illinois at the time. Why was Debs living in Brazil? Well, actually, he was born there! He was the son of Watson Emory (Frederick) Webster, a.k.a "The Traveling Dentist." I have written about Frederick in several blog posts. So, if you have read these posts, you know why my grandfather Debs was born in Sao Paulo, Brazil. 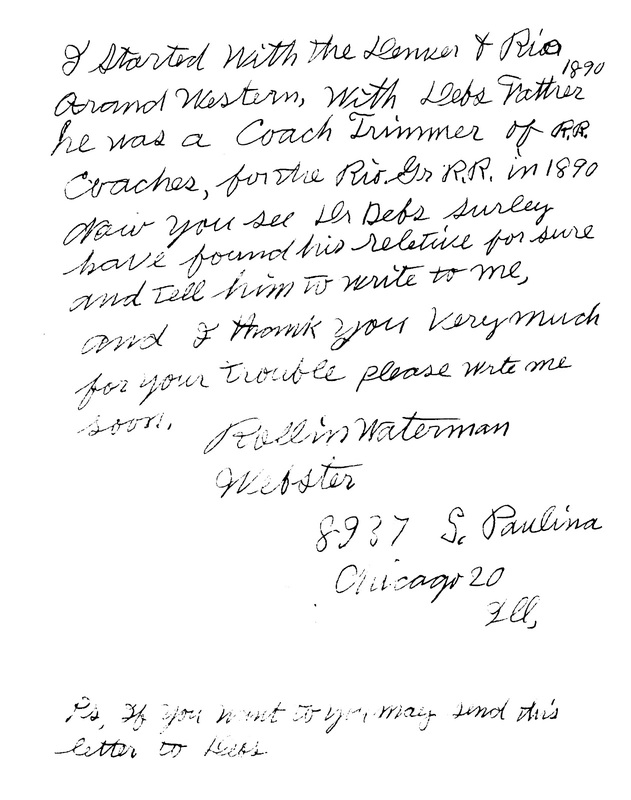 Our sweet Uncle Rollin was 81 years old at the time he wrote this letter. You can see a picture of a younger Rollin from a previous post HERE. Just in case it's difficult to read Rollin's letter, I've included a transcript below - I have included some, but not all, corrections in brackets. I used to work as a Proofreader for a major corporation many years ago, so it has taken a lot of will power to keep from correcting more. But I wanted to keep it as close to the original as possible for historical value, thus, the brackets. 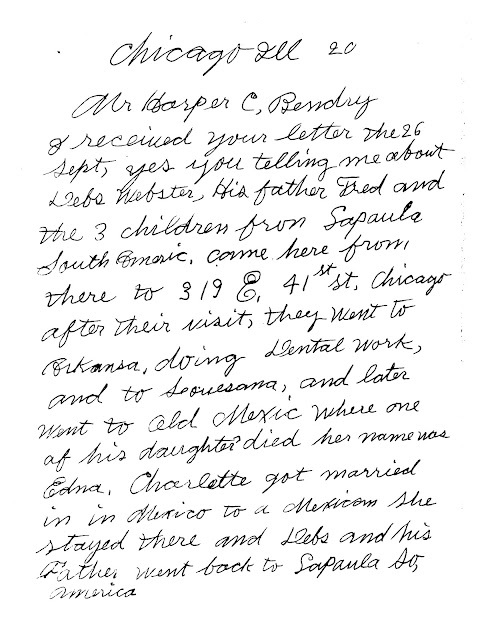 I received your letter the 26 Sept, yes you telling me about Debs Webster, His father Fred and the 3 children from Sapaula [Sao Paulo], South Americ [South America], came here from there to 319 E. 41st St, Chicago after their visit, they went to Arkansa [Arkansas], doing Dental work, and to Louesana [Louisiana], and later went to Old Mexic [Old Mexico] where one of his daughters died her name was Edna. Charlotte[Carlota] got married in Mexicoto a Mexican She stayed there and Debs and his father went back to Sapaul [Sao Paulo], So, America [South America]. Ebenezer Parry [Perry] Carlile Webster, my father, was born in Pomeroy Ohio, my mother’s name was Cinthia Maria Webster, her maiden name was Waterman, she was born in Athens. My father mooved [moved] to Illinoisand then to Iowawhere I was born. I was the youngest in the family. My oldest sister Mary died in infantry [infancy]. 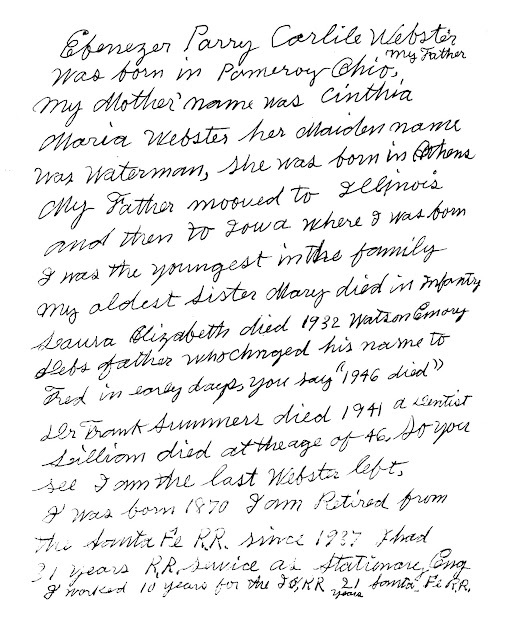 Laura [Lura] Elizabeth died 1932, Watson Emory, Debs' father who changed his name to Fred in early days, you say “1946 died.” Dr. Frank Summers died 1941, a Dentist. Lillian died at the age of 46. So you see I am the last Webster left, I was born 1870. I am retired from the Santa Fe R.R. since 1937. I had 31 years R.R. service as Stationary Eng. I worked 10 years for the I.C.? R.R., 21 years Santa Fe R.R. I started with the Denver & Rio Grand Western, with Debs’ father 1890 he was a Coach Trimmer of R.R. coaches, for the Rio Gr R.R. in 1890. Now you see Dr. Debs surley [surely] have found his relative for sure and tell him to write to me, and I thank you very much for your trouble. Please write me soon. 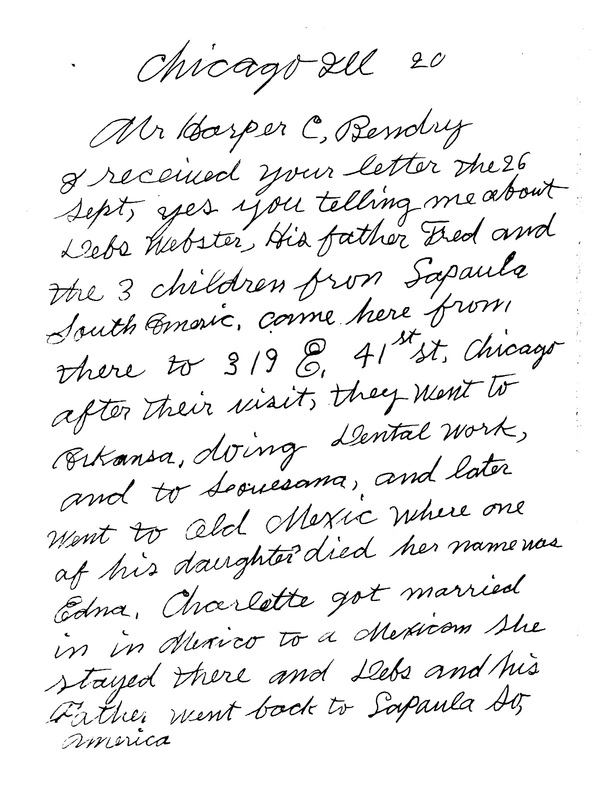 This letter from Uncle Rollin is just filled with genealogical treasures! 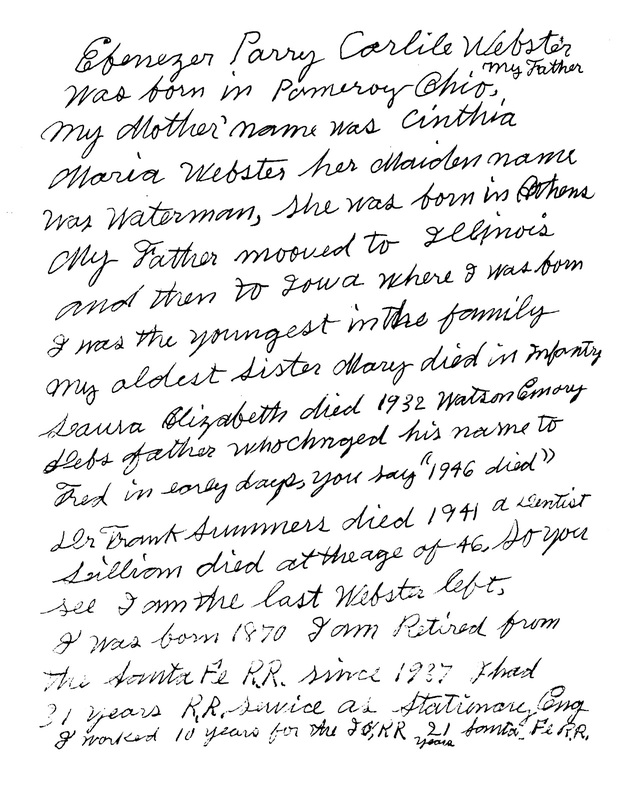 For one thing, it helped to prove (in addition to Frederick's death certificate and Frederick's father's pension file) that my great-grandfather Frederick truly did change his name from Watson Emory to Frederick Emory. It also provided details about Debs' sister Edna's death and his sister Carlota's marriage in Mexico, plus other details about Rollin's siblings. 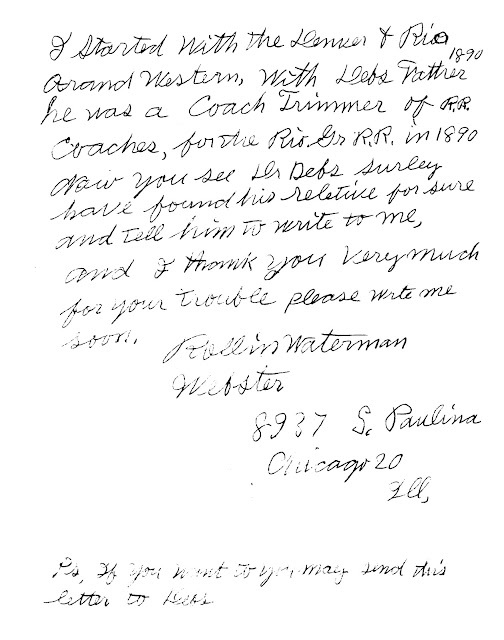 I wonder if Rollin was unaware of the death of his brother Frederick because he said in his letter, "Debs' father who changed his name to Fred in early days, you say '1946 died.'" That makes it sound like he didn't know about that. How very sad! I am so grateful to Mr. Harper C. Pendry for going above and beyond his normal duties in his job at the Athens Board of Trade in helping my grandfather find his family here in the U.S.A. This is the tombstone of my 2nd great-grandfather, Ebenezer Perry Carlisle Webster. He was born on 11 August 1838 in Racine, Meigs, Ohio and died 6 May 1915 in Chicago, Cook, Illinois. Ebenezer's parents were Moses Augustine Webster and Amanda Melvina Carlisle. Ebenezer married Cynthia Maria Waterman on 25 July 1858 in Athens, Ohio. 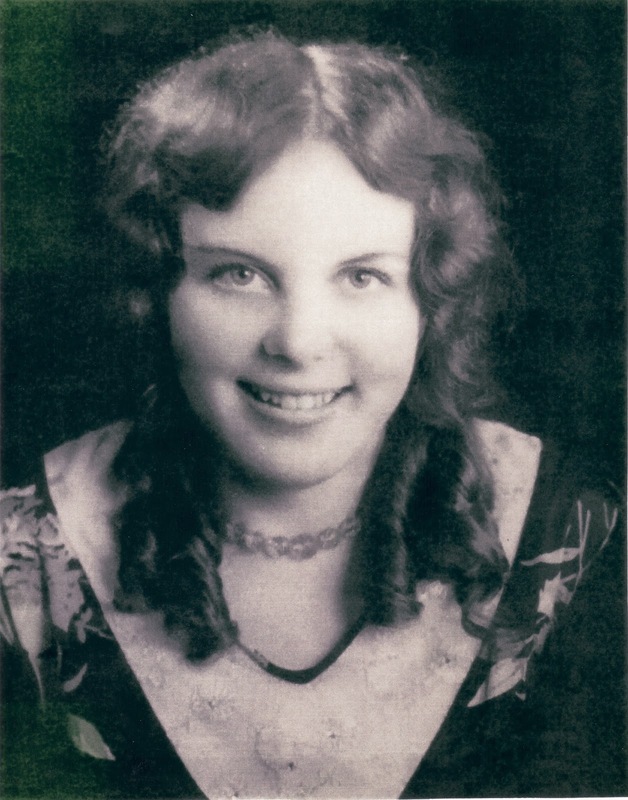 Cynthia was the daughter of Asher Waterman and Bathsheba Paulk. I first introduced you to Asher Waterman in my post Sunday's Obituary - Asher Waterman. Ebenezer and Cynthia were the parents of six children, one of whom was my "Traveling Dentist" Great-Grandfather Watson (Frederick) Emory Webster. I introduced the rest of Ebenezer's and Cynthia's children in my post The Webster Brothers. Ebenezer served in the U.S. Civil War in Company E of the 74th Illinois Infantry. He didn’t serve for very long and was discharged due to health problems. I found this interesting document on Ancestry.com. It's a page from the U.S. Civil War Draft Registration Records. Ebenezer is listed on line 18. It states that Ebenezer had six months of former military service. This reflects his previous service during the Civil War. He first enlisted on 7 August 1862 and was discharged for disability on 18 February 1863. 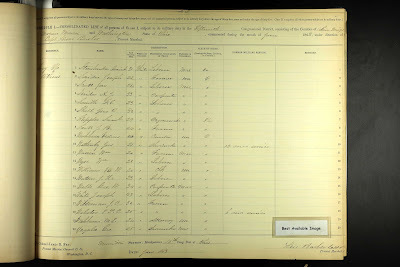 Source Citation: National Archives and Records Administration (NARA); Washington, D.C.; Consolidated Lists of Civil War Draft Registration Records (Provost Marshal General's Bureau; Consolidated Enrollment Lists, 1863-1865); Record Group: 110, Records of the Provost Marshal General's Bureau (Civil War); Collection Name: Consolidated Enrollment Lists, 1863-1865 (Civil War Union Draft Records); ARC Identifier: 4213514; Archive Volume Number: 2 of 3. I have Ebenezer’s Civil War Pension File and will be posting more about him in a future post. This is Asher Waterman, my 3rd great-grandfather. He was married to Bathsheba Paulk. They had 12 children, all of whom were born in Athens County, Ohio: Eliza, William B., Charles Wesley, Eunice, Homer Clark, Jerusha, Jason C., Nancy Jane, Sarah Amanda, Cynthia Maria (my 2nd great-grandmother), Lucy Mae, and Lewis. Ancestry.com. 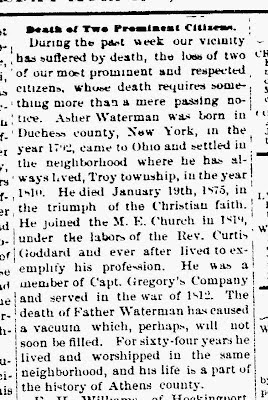 The Athens Messenger (Athens, Ohio) [database on-line]. Provo, UT, USA: Ancestry.com Operations Inc, 2006. Original data: The Athens Messenger. Athens, OH, USA. Database created from microfilm copies of the newspaper. "During the past week our vicinity has suffered by death, the loss of two of our most prominent and respected citizens, whose death requires something more than a mere passing notice. 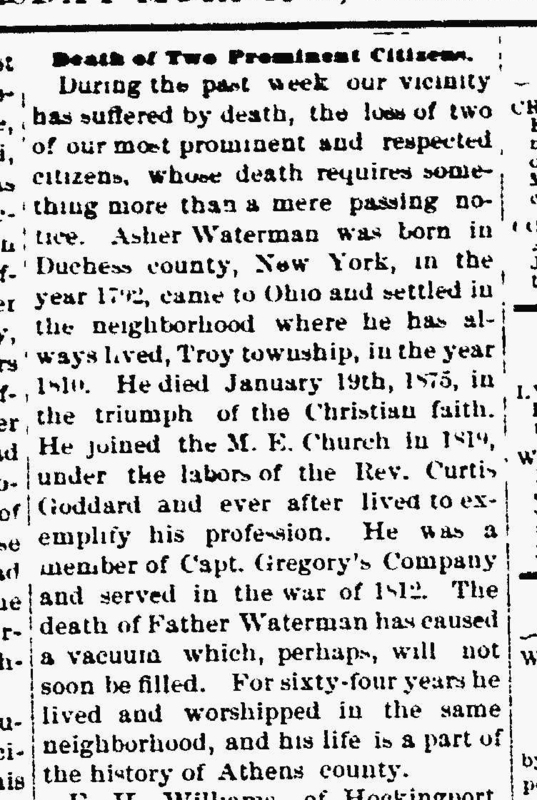 Asher Waterman was born in Duchess county, New York, in the year 1792, came to Ohio and settled in the neighborhood where he has always lived, Troy township, in the year 1810. He died January 19th, 1875, in the triumph of the Christian faith. He joined the M. E. Church in 1819, under the labors of the Rev. Curtis Goddard and ever after lived to exemplify his profession. He was a member of Capt. Gregory's Company and served in the war of 1812. The death of Father Waterman has caused a vacuum which, perhaps, will not soon be filled. For sixty-four years he lived and worshipped in the same neighborhood, and his life is a part of the history of Athens county." 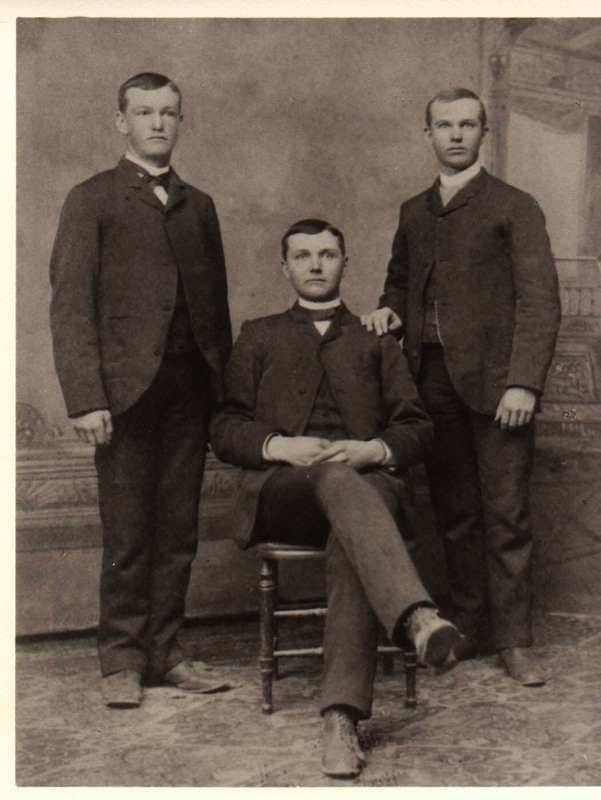 This handsome trio are, left to right: Rollin Waterman Webster (age 13), Frank Summers Webster (age 18), and Watson Emory (Frederick) Webster (age 20). The picture was taken around 1884. Watson (Frederick) is my Great-Grandfather whom I have written about in several posts on my blog. You may remember him as "The Traveling Dentist." I first introduced you to Rollin with my post linked HERE. Mary Alice - born in Winnebago, Winnebago, Illinois on 28 August 1859; died there on 8 March 1862. Lura Elizabeth - born in Winnebago, Winnebago, Illinois on 4 October 1861; died 12 January 1946 in Alhambra, Los Angeles, California. Watson Emory (Frederick) - born in Coolville, Athens, Ohio on 14 February 1864; died 21 July 1946 in Sao Paulo, Sao Paulo, Brazil. 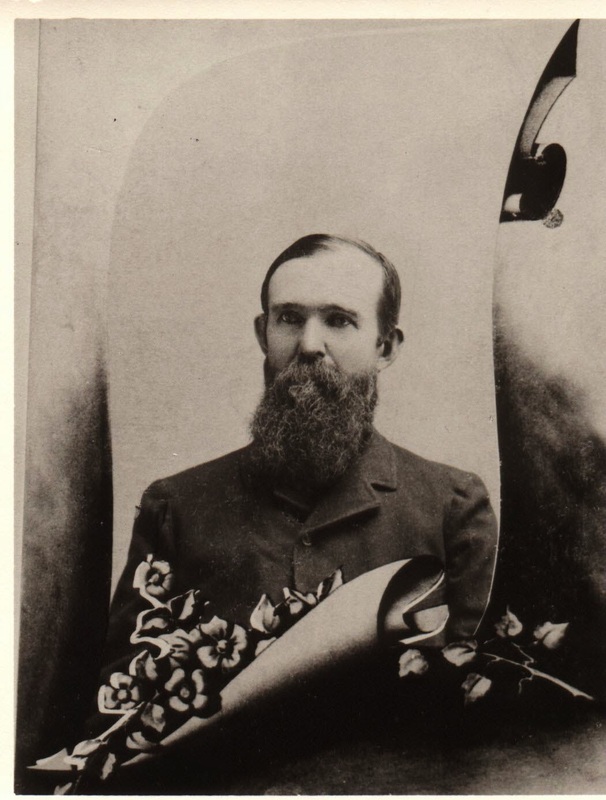 Frank Summers - born in Blairstown, Benton, Iowa on 19 April 1866; died 25 February 1939 in Carthage, Jasper, Missouri. Lillian Dell - born in Blairstown, Benton, Iowa on 17 January 1868; died 28 August 1914. Rollin Waterman - born in Blairstown, Benton, Iowa on 21 October 1870; died 9 October 1962 in Chicago, Cook, Illinois. I will be writing more about this Webster family in future posts. This is the tombstone of Sarah Amanda Waterman Engle. 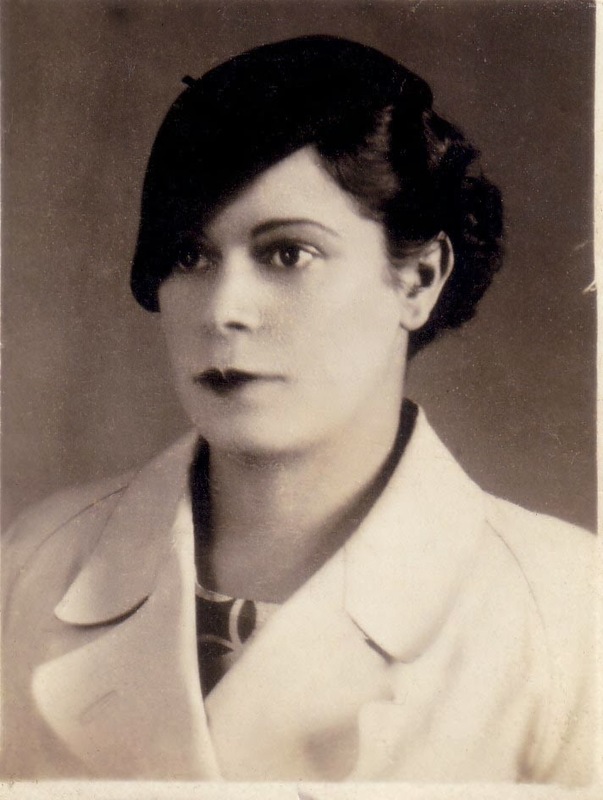 She is my 2nd great grand-aunt. Yes, you are reading those dates correctly! 1836-1939…This remarkable lady lived to be 103 years old! Sarah was born on March 15, 1836 in Coolville, Athens, Ohio and passed away on December 5, 1939 in South Pasadena, Los Angeles, California. She is buried at Mountain View Cemetery in Altadena, Los Angeles, California. Sarah parents’ are Asher Waterman and Bathsheba Paulk. I will definitely be writing a follow-up post (or two) about Sarah. I started my genealogy blog on April 5, 2012. I was and still am a total newbie to the blogging world. I guess you could say I'm a "baby blogger," maybe starting into my toddlerhood. Early on I submitted my blog to Geneabloggers and was accepted on their list. I was so excited! 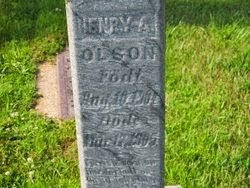 I also learned a lot by perusing other genealogy bloggers' blogs. So, it’s difficult to decide on only one blog series that I’m thankful for and which has helped my blogging experience. (Hmm, I can see I will need to post in the Follow Friday section of GeneaBloggers more often to list my other favorite blogs.) Okay, so in keeping with the assignment to choose one blog series for this post, I'd say that I'd have to choose GeneaBloggers as the blog series I'm most thankful for. GeneaBloggers is authored by Thomas MacEntee. Thomas runs an amazing website! He has been so welcoming to me as a new blogger! And he has gone above and beyond in helping me with a technical difficulty I was having recently with my blog posts not getting uploaded to his fabulous GeneaBloggers website. I love the Daily Blogging Prompts that help us bloggers with topic ideas for our own blogs. And GeneaBloggers is also a great and fun way to get genealogy blogs noticed and read by fellow genealogy bloggers, as well as others searching for their ancestors. And the Blog Resources section is very helpful. All in all, it's just a great website! So thank you Thomas MacEntee for your awesome website GeneaBloggers! 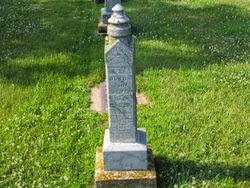 I was so thrilled to find my 2nd great-grandmother's death certificate on FamilySearch.org recently! Her name is Karin Johnsson and she was born in Sweden on July 9, 1850. Karin is the grandmother of my Grandma Ingrid. I introduced you to Ingrid in my earlier posts Wedding Wednesday - Arthur Harry Iverson and Ingrid Anna Gilberg and Matrilineal Monday: Flour Sack Dresses - Ingrid Anna Gilberg. Karin’s parents' names are Johan Larsson and Johanna Christina Lycka. Karin married Johan Erik Carlsson. She immigrated to the United States sometime before 1910. In the 1910 Federal Census she is listed as "Carrie," not Karin and she was living with her daughter Hilda Gillberg's family in Salt Lake City, Utah. The census also lists Karin's year of immigration as 1891. That is a different year than what was recorded in my Grandmother Ingrid's history. I'll have to do some research to resolve this. I also find it interesting to see that according to this census, Karin (Carrie) could speak English, while the rest of the family could not, and instead spoke Swedish. I’m also thankful for Ancestry.com because I was able to find cemetery records for Karin so now I can go visit her gravesite. Speaking of Karin's gravesite, I discovered a really awesome website called Names In Stone. Maybe I'm a latecomer in regards to knowing about this website, but just in case there is anyone out there who doesn't know about it, I wanted to share. I googled Salt Lake City Cemetery, which is where Karin is buried and found this awesome website Names In Stone. I was able to pinpoint Karin's exact plot at the cemetery using their website's search engine. How great is that? Here's a link to Karin's actual plot map so you can see what this page on the website looks like: Carrie Carlson. And if you click on the Cemetery Info tab at the top you see a map of the cemetery and the location of your ancestor's grave. This should definitely be helpful when I visit Karin's grave sometime in the future. 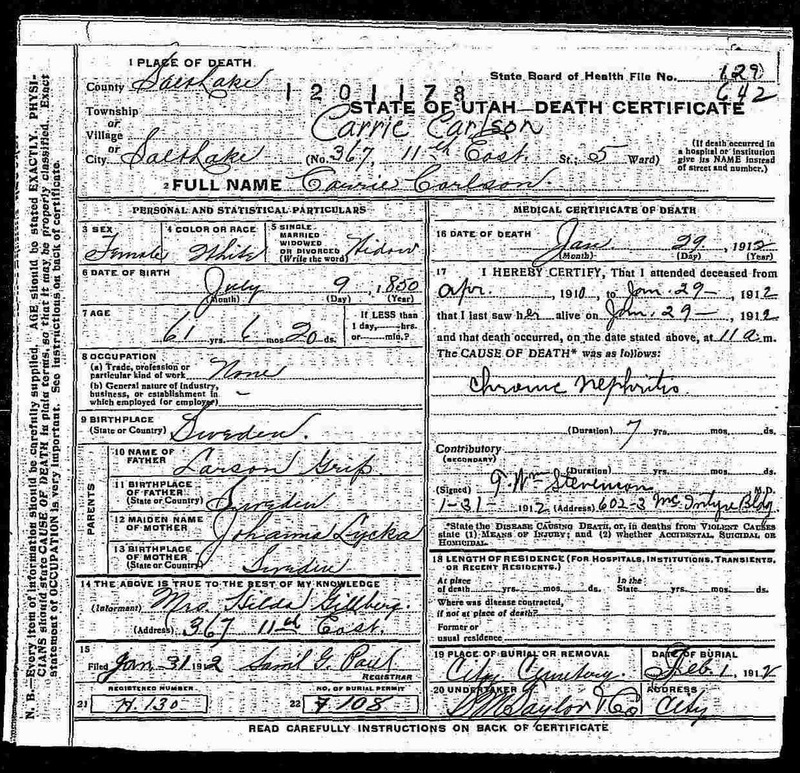 Year: 1910; Census Place: Salt Lake City Ward 1, Salt Lake, Utah; Roll: T624_1605; Page: 9A; Enumeration District: 0096; Image: 667; FHL microfilm: 1375618. Ancestry.com. 1910 United States Federal Census [database on-line]. Provo, UT, USA: Ancestry.com Operations Inc, 2006.